We enjoyed this guesthouse because it was quiet, tucked away from the busy part of the city, but we still had access to many shops and restaurants. 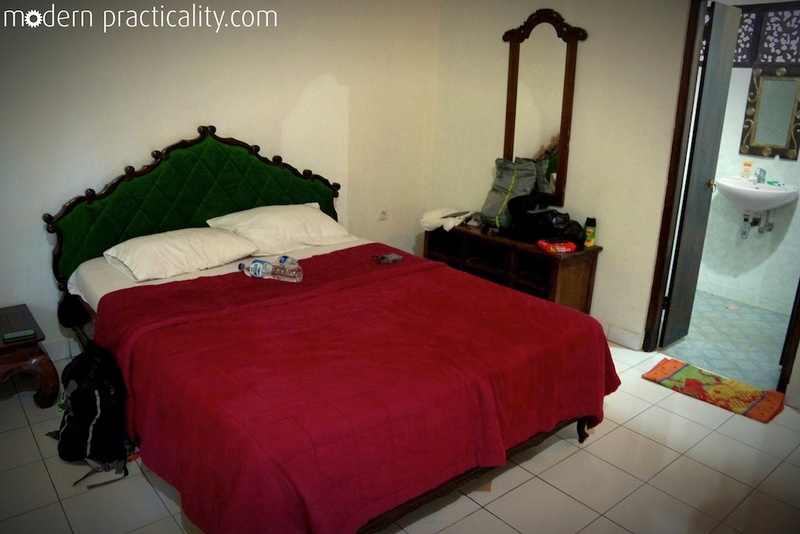 We stayed for the whole month and paid only 3,500,000 rupiah (around $12 USD a night). Our room did not have AC, just a fan, but being up on the hill it never got too hot. We had a double bed, hot water, a big shower, a porch and fresh fruit and tea every morning. We would recommend this place to anyone staying in Ubud. 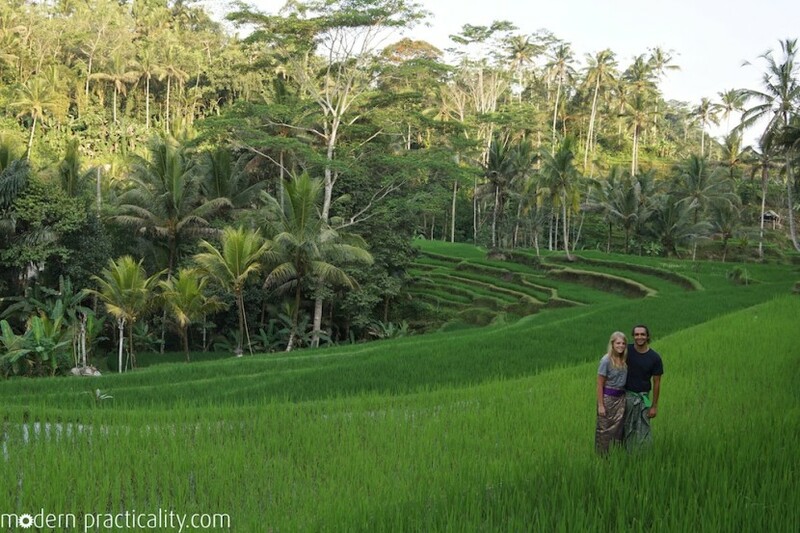 The owners Wayan and Puri are extremely kind and will make you feel like you’re at home. This restaurant didn’t have the best food and most of their items were overpriced, however, they had the best pizza in Ubud. We would share the chicken special pizza for dinner and it would cost 57,050 rupiah. We wouldn’t recommend the sausage pizza. 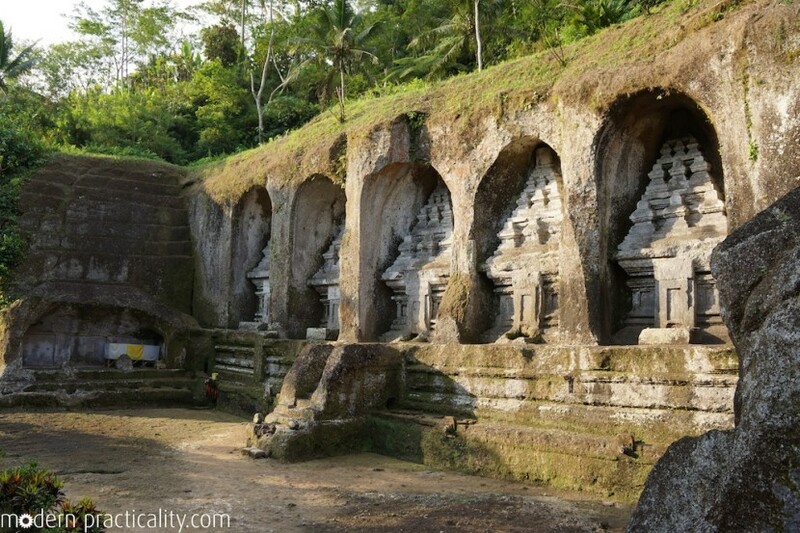 We spent many days and lots of rupiah here. It’s not the best restaurant in the world, but it’s cheap, has a great atmosphere, free wifi and pretty good food. We liked the fruit salad, fish and veggie curry, nasi goreng, and honey chili chicken. We would get two dishes and drinks for 90,000 rupiah. Another good and cheap restaurant, though for an American, serving sizes might be considered a bit small. They don’t provide the quickest meal in town, but what you do get is delicious. They have free wi-fi. This little cafe is pricey, but might be the only place in Ubud to purchase anything organic, vegan, or gluten-free. The smoothies and juice blends offer a necessary break from the substantial amount of fried food you will consume when eating traditional Indonesian food. A great atmosphere rounds out the experience. There is free wifi but it is rather slow. This new restaurant is located toward the end of Jalan Raya, a bit past Puteri Minang. 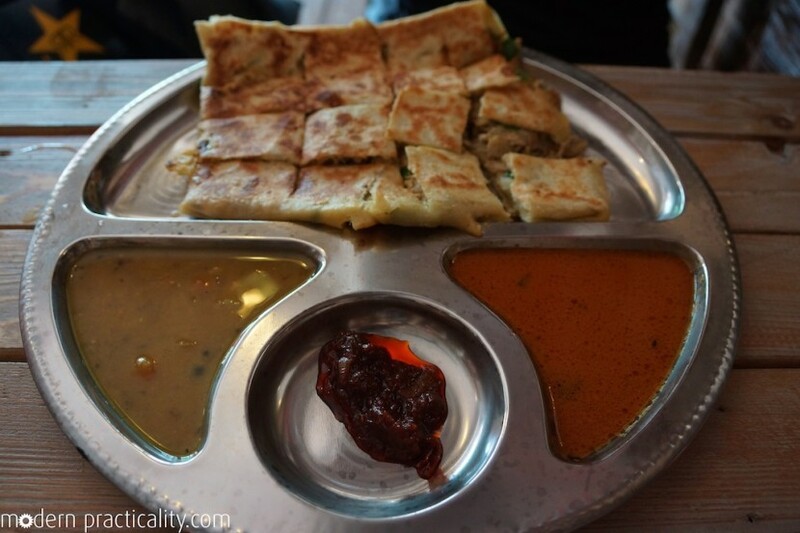 Roti prata is a popular dish from Singapore. It’s fried dough, like a pancake, that is served with curried dipping sauce. Our favorite dishes here were the paper prata, chicken murtabak and teh terik with ginger. We would both get a prata and a tea for about 115,000 rupiah. A great place to try Nasi Padang in Ubud. The atmosphere is spartan but the food they serve up is the real deal. 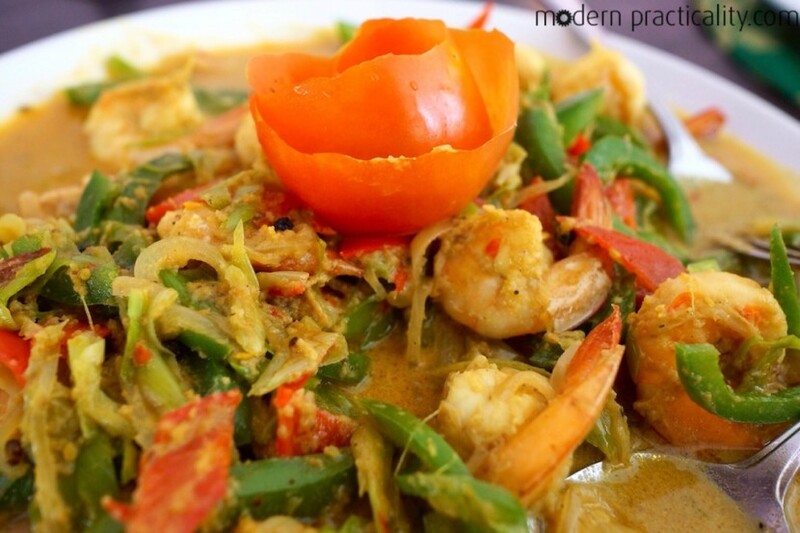 There are 20+ different plates to choose from, and 90,000 rupiah will buy a feast for two. 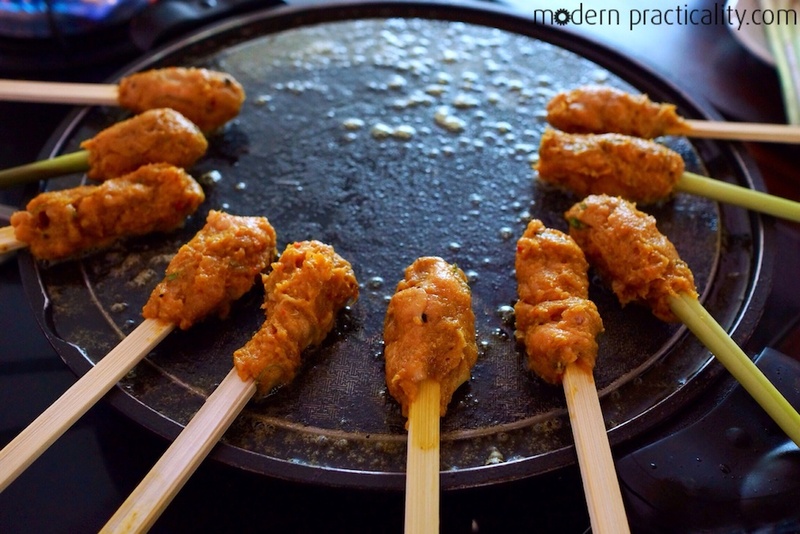 Some of our favorite dishes are: rendang daging (chunks of beef slow-cooked in coconut milk and a paste of mixed ground spices), rendang ayam (chicken), fried shrimp, okra, jackfruit, water spinach, eggplant, and perkedel kentang (fried potato patties). If you can learn how to make these babies, you’ll have no shortage of friends. This Balinese dance is one of a kind. 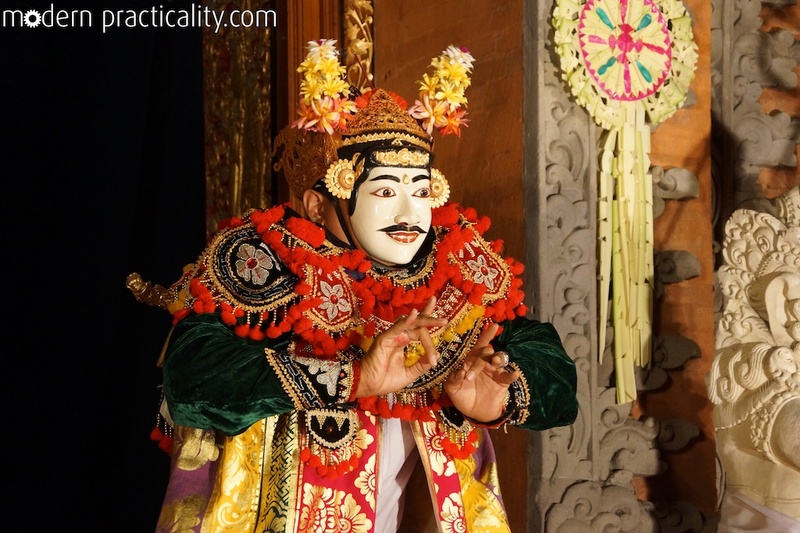 The music, costumes, makeup and movements are all fascinating. 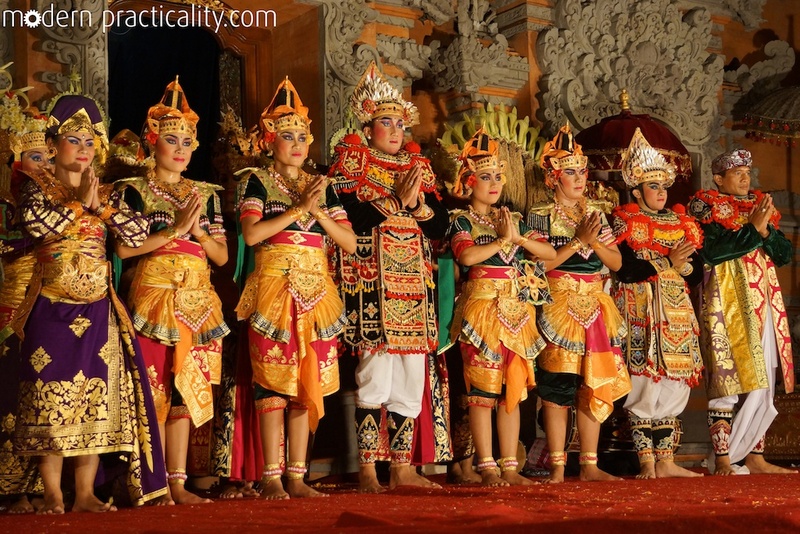 The performance we went to was located at the Ubud Palace, right in the center of town. It costs 80,000 rupiah per person. This forest was beautiful and full of frisky monkeys. 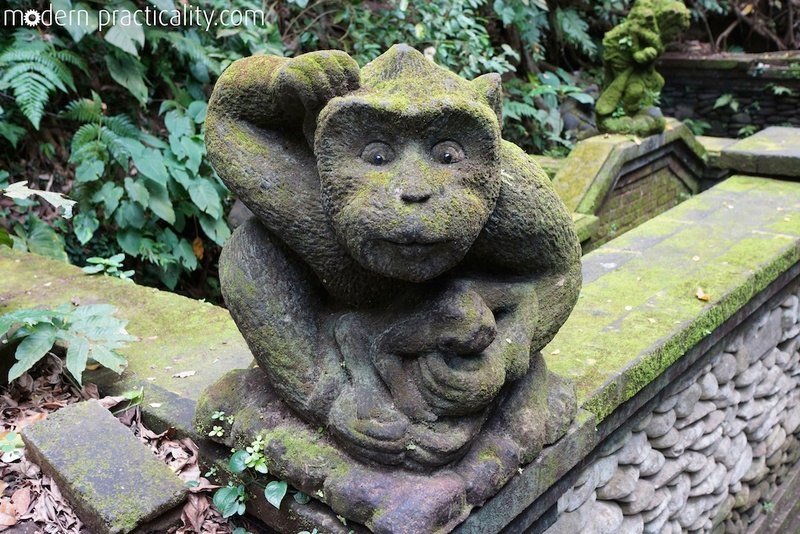 It costs 20,000 rupiah to enter, and another couple dollars to buy some bananas to feed the monkeys, not recommended. A monkey climbed up Haley and snatched a banana right out of her hand. 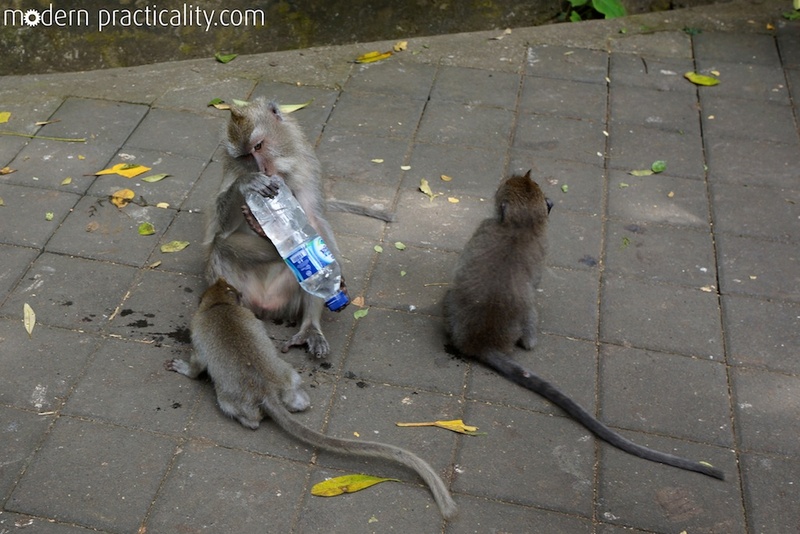 It’s a fun thing to do if you aren’t afraid of monkeys. 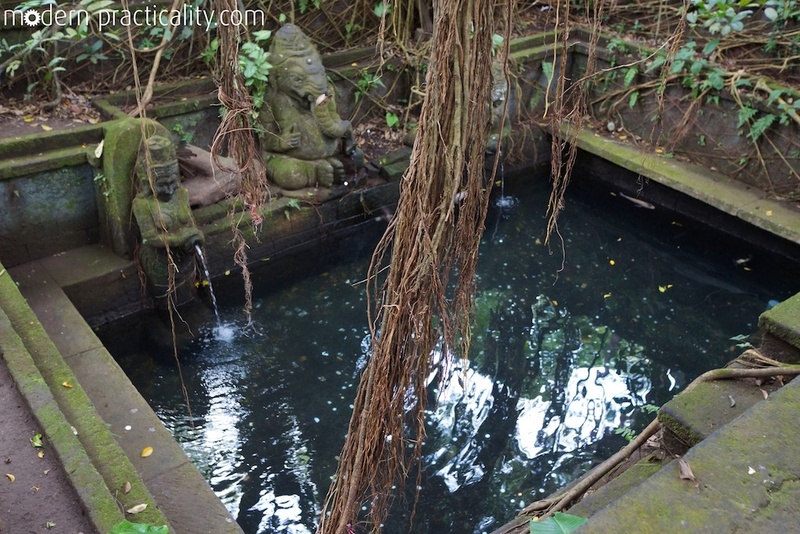 This is an 11th century Hindu temple located in Tampaksiring, about 25 minutes outside of Ubud. 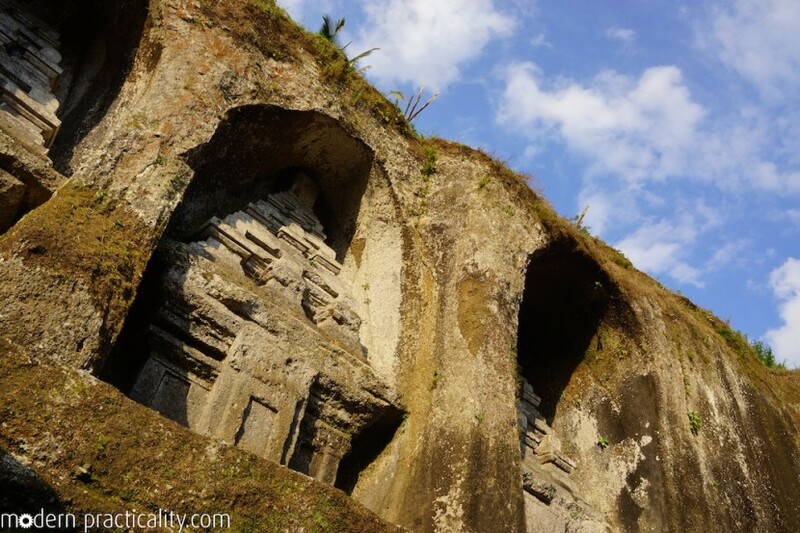 The temple features huge carvings etched into sheer rock walls and sits right on a beautiful river. 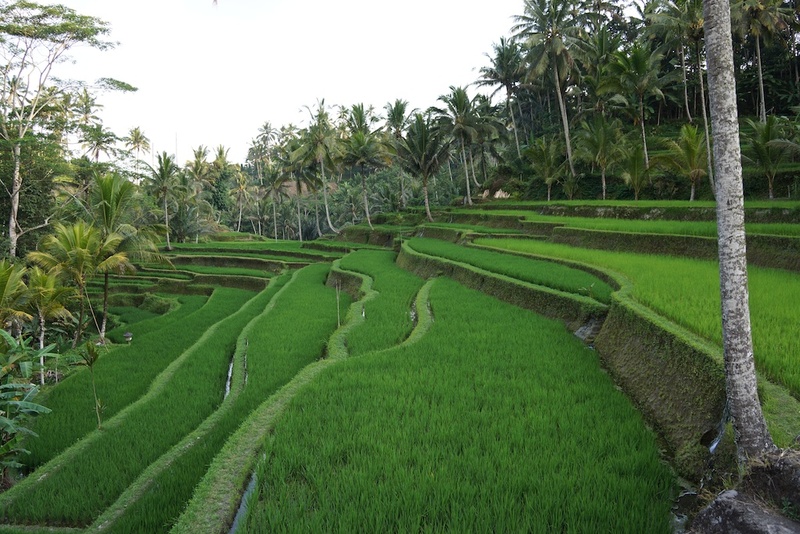 As you enter the temple, past all the vendors trying to sell you trinkets and sarongs, you’ll see beautiful terraced rice paddies for days. It costs 15,000 rupiah per person. 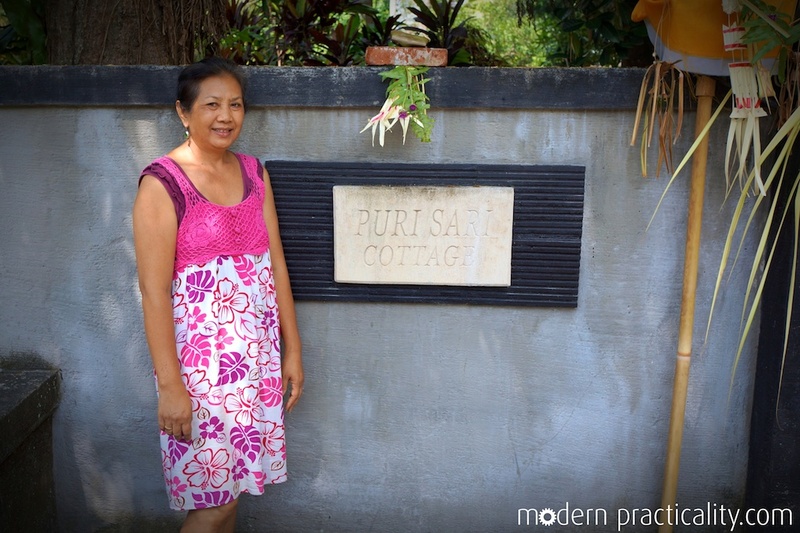 You can bring your own sarong to wear, purchase one outside of the temple or rent one (all they ask for is a donation). We bought sarongs because we needed them for a temple ceremony we were attending, they were about 80,000 rupiah each. Click here to see more photos of this remarkable temple. Cooking classes seem to be a popular thing to do in Ubud. 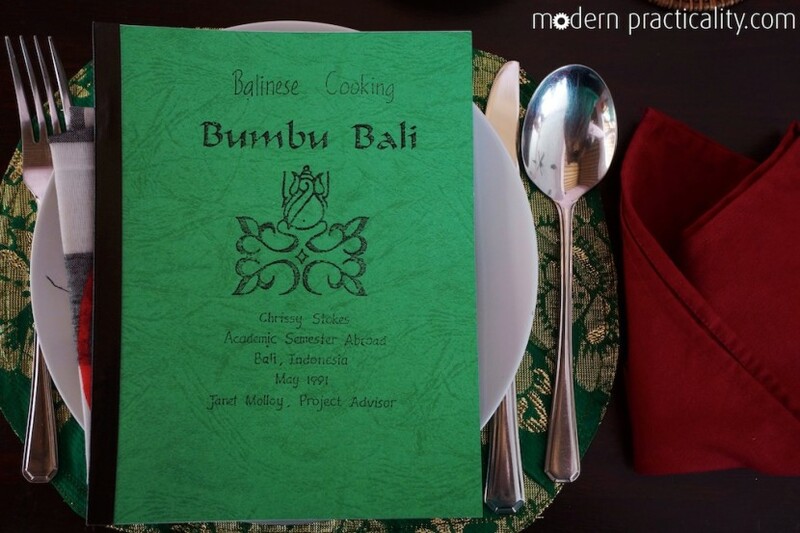 We took a class at Bumbu Bali. The food was great, but you don’t really get to do any of the cooking yourself. We would recommend finding another one! Ours cost 350,000 rupiah per person. If you still want to take this class, make sure you call ahead (+62 361 976 698) and make a reservation. The class starts with a tour of the produce market around 9AM and ends with lunch around 2PM. Fantastic information, thank you so much for sharing!